This information was sent to TNA by the Alcohol Beverage Regulation Administration (ABRA) and may be of interest to Trinidad residents. Members of the public that want to comment on the petitions at the hearing should contact ABRA General Counsel Martha Jenkins by 4 p.m. on Monday, May 30, 2016. Provide the full name, title and organization, if applicable, of the person(s) testifying. Those providing input should bring six copies of their testimony to the hearing. Testimony may be limited to five minutes in order to allow every person an opportunity to be heard. Trinidad Market / Mike’s Market, at the corner of Florida and Trinidad Avenues NE, has submitted a request to the Alcohol Beverage Regulation Administration (ABRA) to obtain a Class A Liquor License. This would allow them to begin selling liquor in addition to beer and wine. The request comes with a change in hours that would allow them to remain open for business from 7 am to midnight each day. The notification from ABRA is below. The community can be engaged in discussion on an ABRA application request during the review process. A business seeking a change in an existing license or a new license should present as a Single Member District (SMD) meeting of the Advisory Neighborhood Commission (ANC), at the larger ANC meeting, and at community meeting, if one is called, to discuss the license request. There can be a protest to stop a license change or to seek a settlement agreement with the community or group with standing to protest the license. You can learn more about ABRA laws and regulations and protest procedures on their website. As with all development taking place in the neighborhood, we hope that Trinidad residents become involved and active in voicing their views on pending changes. The DC Department of Transportation issued a press release on October 6th with the Bikeshare Development Plan for public feedback (see below). The comment period is open until November 15, 2015. The scenario recommended would add 99 stations throughout the city and expand a dozen others in core areas downtown and in high-density neighborhoods over the next three years. Trinidad and Carver Langston would be slated, under the proposed scenario, for new stations in 2018. This would complement the one station we have in Trinidad located outside the Joe Cole Recreation Center on Neal Street. The report is worth a glance if you are a Bikeshare user or are interested in transit options and equitable access to resources. (Washington, DC) The District Department of Transportation (DDOT) today released a draft of its first ever Bikeshare Development Plan for public feedback. The draft plan establishes a set of goals, measures, expansion plans, and financial projections for the next six years for the District of Columbia’s portion of the Capital Bikeshare program. 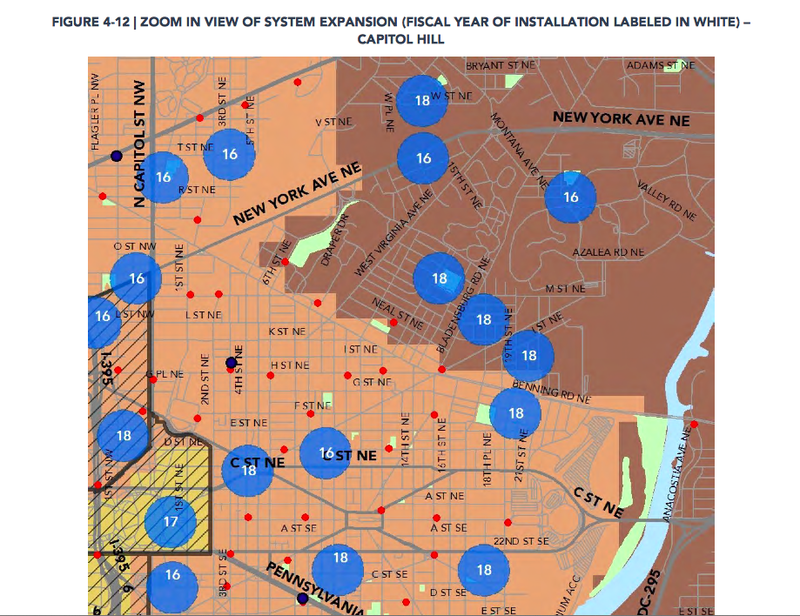 Under the proposed plan, Capital Bikeshare in the District would expand by 99 stations over the next three years, doubling the number of stations east of the Anacostia River. By 2018, approximately 65 percent of residents, 90 percent of jobs, and 97 percent of all transit entry and exit points in the District would be within a quarter mile walk of a bikeshare station. The Capital Bikeshare program is a partnership between the District of Columbia; Montgomery County, Maryland; Arlington County, Virginia and Alexandria, Virginia. DDOT is soliciting feedback on the draft Bikeshare Development Plan, and anyone can comment on this webpage, http://dcforms.dc.gov/webform/capital-bike-share-form, until November 15, 2015. The mission of the District Department of Transportation (DDOT) is to enhance the quality of life for District residents and visitors by ensuring that people, goods, and information move efficiently and safely with minimal adverse impact on residents and the environment. Follow us on Twitter for transportation-related updates and more; like us on Facebook and visit the website at http://www.ddot.dc.gov. Visit goDCgo.com for more information on transportation options in the District. There are three updates to zoning cases for Trinidad properties that were scheduled in the September 15, 2015 hearing of the Board of Zoning Adjustment (BZA). The review of parking variance for the proposed dialysis facility on Bladensburg Road was delayed until October 20th. This is case 19004.
Review of the parking variance for the Thornton Development property at the corner of Florida and Montello Ave NE was delayed until October 27th. This is case 19061. DDOT did not have objection if Thornton Development also installed 3 long-term bike racks and 1 short-term bike rack. They agreed to do so. ANC 5D did not submit a letter or attend the hearing. The project had been discussed in previous ANC 5D06 Single Member District meetings. There was discussion on ANC 5D, the current “situation with internal conflict”, and difficulties of getting zoning cases on the Chair’s agenda. The Zoning Chair also noted that “They are having some serious issues in ANC 5D.” The discussion continued and the case was voted on without input from ANC 5D. There was opposition from a resident in the 1100 block of K Street NE who cited Zone 6 parking issues. He noted that he has had to park as far as three blocks from his house as Maryland residents park on their streets, clients of H Street businesses park on their streets, and the additional parking pressure coming from new condos being built on Florida Ave NE in Zone 6 and Zone 5 will exacerbate the problem. He requested that ANC 6A be consulted on this issue with DDOT and BZA and that the case be delayed until such time and then heard in conjunction with BZA Case 19061. Mr. Anthony Hood, Chair of the Zoning Commission, noted that there has never been an issue with ANC 6A weighing in on projects that border two ANCs in the past. Mr. Lloyd Jordan, BZA Chair, noted that they would continue with the hearing as scheduled. What is important to note here is that ANC 5D, when better placed to react to zoning issues in the future, should also be consulted on projects in the neighborhood across Florida Ave NE. The transcript of the hearing and other documents related to the BZA cases can be found on the Office of Zoning website. Case numbers cited above can be used to search for documents related to these specific cases. Eliminate the D3? Extend the D4 route to Kennedy Center, replacing part of the 80 bus route? More X1 and X3 buses on the route during the day? Those are some of the proposed metro bus route changes that WMATA is considering. They will be holding public hearing number 606 on September 17, 2015 on the proposed changes. The public information session will begin at 6 pm and public hearing will be at 6:30 pm. The hearing will be held at Metro Headquarters Building 600 5th Street, NW. The hearing is a public forum and all are invited to present their views. If you wish to speak at the hearing, please submit your name and organizational affiliation, if applicable, by email to speak@wmata.com or by phone to (202) 962-2511. You can also submit written statements by 5 p.m. on Wednesday, September 23, 2015 to writtentestimony@wmata.com. Not ready to submit written testimony or attend the hearing? You can participate in a survey at http://www.wmata.com/betterbus. The survey opened on August 15th and will close on September 23. It includes feedback questions on the proposal and related service changes as well as demographic questions. You can view all proposed route and tariff changes here. Miss the recent ANC meeting on August 11th? A resident of Carver-Langston takes video of our ANC meetings, as they are public forums. The videos are available to watch on YouTube if you want to keep up with events in ANC 5D. The links below are to the Twitter notices of the videos and a link to the videos on YouTube. The videos are in sections to facilitate taping and uploading/downloading files. The Bodega Market on Florida Avenue has applied to the Alcoholic Beverage Regulation Administration (ABRA) for a substantial change to its license, from a Class B to a Class A. That means it would expand to sell spirits as well as the beer and wine already offered in the store. The Bodega has reportedly purchased the liquor license from Brothers Liquor, which earlier this year closed their store located next to the Bodega. A previously scheduled public hearing has been rescinded by ABRA and a new hearing schedule posted. We anticipate this coming before the ANC with a community meeting in Single Member District 5D06 before the petition date. TNA will post notice of the meeting as soon as we have details.The ANC can vote to support or protest the application. ABRA also enables residents to protest a liquor license application: How To File a Protest. Address: 1136 Florida Avenue, N.E. Notice is hereby given that this licensee who has applied for a substantial change to his license under the D.C. Alcoholic Beverage Control Act and that the objectors are entitled to be heard before the granting of such on the hearing date at 10:00 am, 2000 14th Street, N.W., 400 South, Washington, DC 20009. A petition or request to appear before the Board must be filed on or before the petition date. Class Change from a Retailer B to a Retailer A.